May 21-June 29, 2011 SMART (Sustainable Materials and Reclaimed Things) Art and Design Show will feature art, furniture, instruments, portable buildings, craft, etc, created out of SMART (Sustainable Material and Reclaimed Things) This juried and invitational show will feature top recycling artists and designers from Michigan. Participating artists include: Ritch Branstrom, Andy Gregg, Betty Bea Washburn, Robert LaLonde, Tom Kaufmann, Jeff Krino, John Goss, Stella Larkin, Karen Godfrey, John Unger, Doug Delind and Lanni Lantto, Meredith Krell, Steve Toornman and others. The opening reception will be Saturday, May 21 with musical entertainment provided by the Charlevoix Sax Quartet. The closing reception and awards presentation will be Saturday, June 25th. Awards will be determined by people's choice voting (one vote per person) Voting to take place at the Cycling Salamander between May 21 and 10pm on June 24. 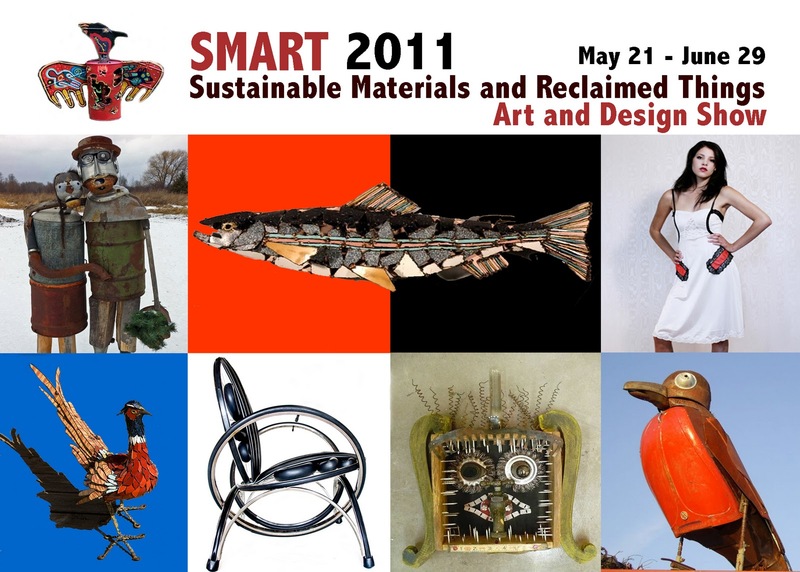 Cycling Salamander is taking submissions for jury through May 15, 2011. If you're interested in participating in the show please email images of your work or include a link to your website.